Till now, 2 way email integration has allowed for staff responses to be added on a ticket, by merely replying to the notifications that staff members receive via email. This is beneficial for staff members or help desk agents in the field, when it may be difficult for them to actually make use of the web interface, to stay updated of new tickets and respond where needed. 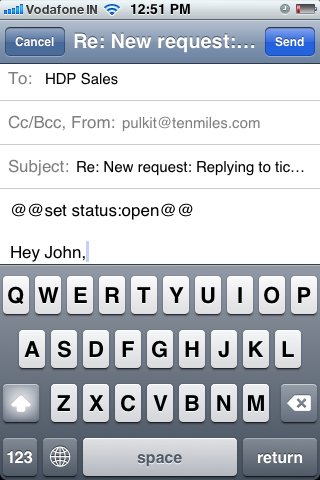 Helpdesk Pilot is now even more mobile-device friendly, as staff can now perform ticket level actions when replying to end users, via email. These actions include changing a ticket’s status, priority or the assignee (staff member to whom the ticket is assigned). where [action] could consist of a combination of status, priority or assignee changes. Let’s have a look at how a ticket’s status can be changed, through this example. 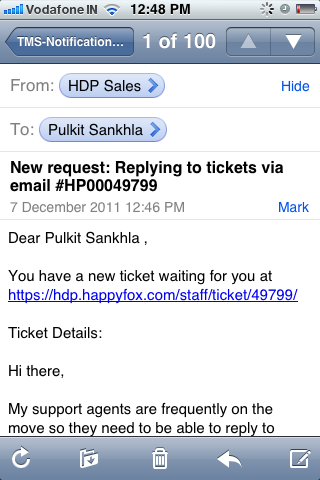 John Doe sends in a request and Pulkit Sankhla (from the Helpdesk Pilot Team) is notified of this ticket via his iPhone, since he’s currently on the move. The tag has to be inserted in the first line of the response, following which the rest of the message can be typed out. Pulkit then sends the response, which gets routed through Helpdesk Pilot and then onto the customer. Helpdesk Pilot will strip the first line of the response, thereby removing the action tag and ensuring that the customer receives only the actual message. If we now look at the ticket display, within the staff interface, we can see that the reply has been appended (after removing the action tag from the message body) and the status changed to OPEN. In such a way, the tag used can be extended to include status, priority and assignee, as required. For more details on how these tags can be used, please visit the Notifications page within your admin’s Manage section, or simply get in touch with us. The ability to perform ticket level actions via email offers more capabilities to field agents and makes for more efficient ticket management, when on the move. Leave a comment and let us know what you think of it! This entry was posted on Wednesday, December 7th, 2011 at 7:47 am	and is filed under Helpdesk Pilot. You can follow any comments to this entry through the RSS 2.0 feed. You can leave a comment, or trackback from your own site.